Where do you live or work? What would make this area even better? Thought provoking questions – and literally “close to home” for the citizens who took the opportunity to provide answers at a workshop designed to receive their help charting the future of their community. 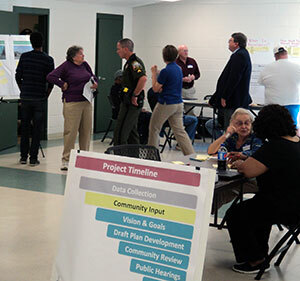 On the afternoon of October 13, the Chesterfield Planning Department hosted a workshop at the Bensley Community Center for citizens interested in the Northern Jefferson Davis Corridor Special Area Plan. About 30 citizens attended the workshop and provided input on how to improve their community as a place to invest, live, work, shop and play. With county staff and their Board of Supervisors representative in attendance, many freely expressed love for their community, and hope for a brighter future for the neighborhoods and businesses that have grown up along or near Jefferson Davis Highway. This effort will update the current Jefferson Davis Corridor Plan, which was adopted in 1993, and includes an area with a unique blend of neighborhoods, economic development opportunities, cultural diversity, and natural and historic resources. The comments provided by citizens who attended the workshop reflected their interest in their community and their hopes for the future of the area. Their comments, and those of others who participate in the plan amendment process, will make important contributions to framing the draft plan that will be forwarded to the Planning Commission and Board of Supervisors, for their consideration in late 2016 or early 2017.